Melissa Henry, from Boorowa in southern New South Wales, Australia, is a busy woman. She is a mother, the proprietor of Quebon Coloured Sheep Stud and, when she returns from maternity leave, a Senior Natural Resources Management Advisor with South East Local Land Services – a state government body designed to deliver agricultural production advice to farmers and the community. "I'm proud of the product that we produce - clean naturally coloured fleeces that go on to be handspun and felted into beautiful items." Melissa is not from a rural background. She grew up in western Sydney and discovered agriculture and animals while at high school, where she quickly fell in love with coloured sheep. While at school Melissa was fortunate to spend a year in Canada as an exchange student and post school completed a Wildlife Ranger course in South Africa and returned to Canada on a Simmental Scholarship, before studying a Bachelor of Animal Science back home in Sydney. In 2004 she purchased her favourite Corriedale coloured sheep “Baabra” from her old high school and began her own stud, marketing the richly coloured fleece to artisans, hand spinners and felters. The sheep travelled with her to Boorowa, agisting for twelve years on local properties before they found a home of their own. Now Melissa and her partner Simon have bought their own 25 acres of land, named appropriately “Baabra’s Hill”, at Young and are fencing and planting trees to keep the sheep happy. 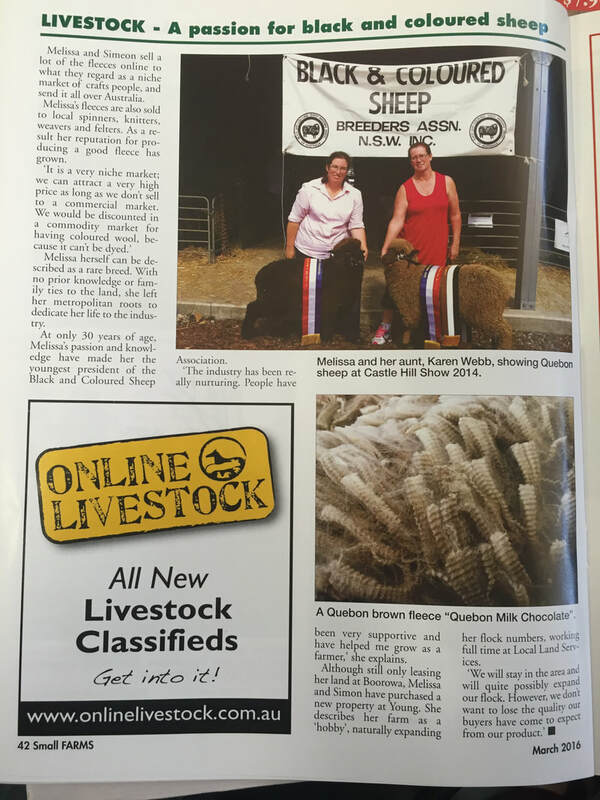 Melissa is President of the NSW Branch of the Black and Coloured Sheep Breeders Association and can often be found at the local agricultural shows where her sheep are regular champions. She is also proud to wear winter woollies knitted from the fleece of her sheep and now at shearing time there is an extra face, with Melissa and Simon’s first child Ruby being born last September. As a Natural Resources Manager Melissa’s professional life sees her liaising with farmers on a daily basis, communicating the latest in environmental best practise and facilitating projects to aid farmers and the community. She also engages with school children as a part of The Archibull Prize, which encourages a new generation to follow her path into agriculture. Wool is such a great asset and one that rural folk like ourselves absolutely treasure. We are stoked to see you have fallen in love with coloured sheep and all they can bring to the industry. Its great to have you as part of the AgWomen community Melissa. Click here to watch the episode on The New Black or view on the Home page. 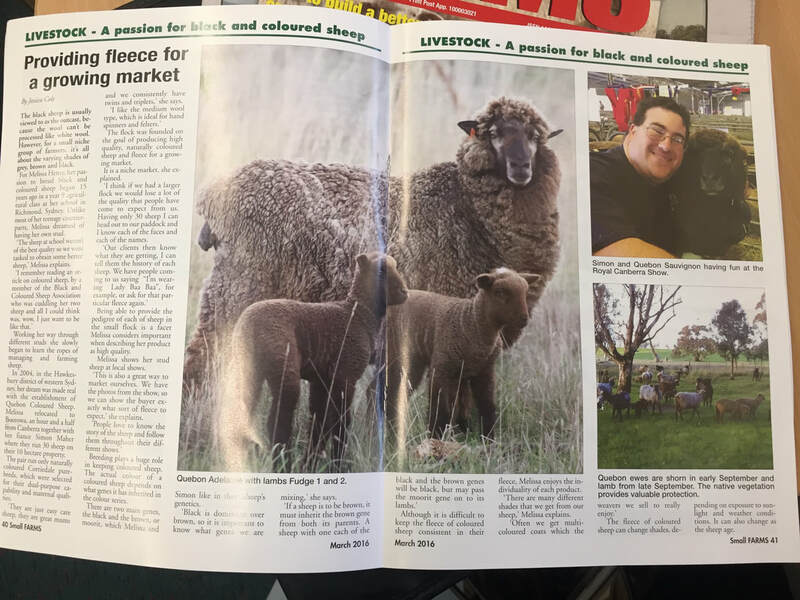 Boorowa sheep producer Melissa Henry tells Skye Manson why she decided to start direct marketing her fleeces by mail order. Click here to listen to the radio interview. ​Click here to view a presentation about Melissa Henry's career pathway into agriculture and the Australian Sheep Industry, presented to Sydney and country school students as part of the Art4Agriculture Archibull Prize and Young Farming Champions program.